Acajuba occidentalis (L.) Gaertn., Anacardium microcarpum Ducke, Cassuvium pomiferum Lam. The cashew tree (Anacardium occidentale L.) is a medium-sized tropical tree usually cultivated for its fruit (cashew nut) and pseudofruit (cashew apple). It is also a multipurpose species that provides a broad range of services. About 30-40% cashew kernels are discarded during the process of roasting and are then fed to livestock (Göhl, 1982). The cashew tree is a spreading, low-branched, evergreen and medium-sized tree. It can grow to a height of 6-12 m. It is many branched. The crown has a globose shape and is 6-15 m in diameter, though a specimen in Brazil is famous for its circumference of 500 m. The cashew tree has a deep taproot and develops many lateral roots that enable its survival during dry periods (Orwa et al., 2009). The leaves are alternate, leathery, borne in terminal clusters, oval-obovate-shaped, 10-20 cm long x 5-10 cm broad. Pale green or reddish when young, they become dark green when maturing (Orwa et al., 2009).The inflorescences are 15-25 cm long terminal panicles of male, female and bisexual flowers. Flowers are pentamerous, no more than 1 cm in diameter, yellowish-pink in colour, and very fragrant. They are attractive to bees and provide a good source of honey (Morton, 1987; FAO, 1982). The fruit is a kidney-shaped nut consisting of a double-walled shell with a hard epicarp, a poisonous mesocarp and a thin endocarp, and an edible kernel surrounded by a thin testa. The fruit does not split open at maturity, but once its fruit is fully grown but not ripe, its receptacle swells and becomes a fleshy, juicy, pear or apple-shaped edible pseudofruit that is called the cashew apple (Orwa et al., 2009; Morton, 1987). This pseudofruit has a very conspicuous yellow, red or red-and-yellow colour. 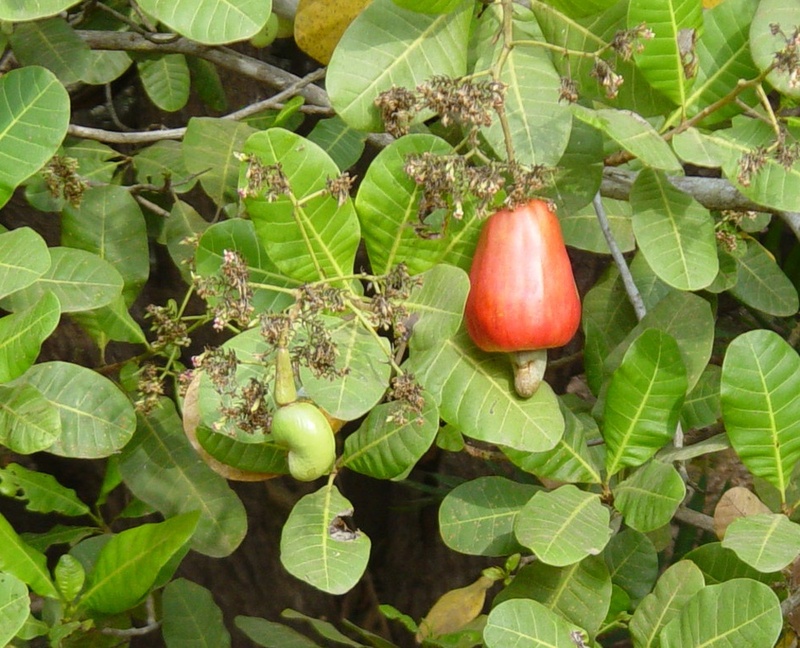 The cashew tree is a multipurpose species, and cashew products have a wide range of uses. The kernel of the cashew nut, the pseudofruit (cashew apple) and the leaves are edible. Almost all parts of the cashew tree are reported to have ethnomedicinal properties (Morton, 1987). Cashew nuts (kernels) must be extracted from their poisonous shell with caution in order not to be contaminated by the toxic substances embedded in the mesocarp. Once extracted from the nut, the kernels are roasted to destroy the remaining toxins (Orwa et al., 2009; Morton, 1987). The kernels are a nutritious food as they contain large amounts of fats, protein, carbohydrates, vitamins and minerals. Discarded cashew nuts are nuts unfit for human consumption. In the literature they are often referred to as cashew nut meal or cashew nut reject meal. They are used to feed livestock. 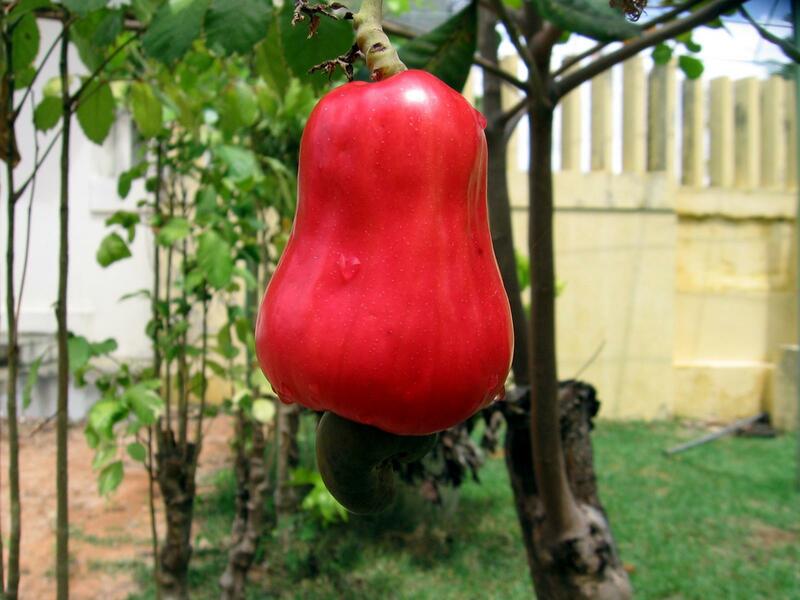 Cashew apples (pseudofruit) are too fragile to be suitable for transport and relished only in areas of production, such as Brazil, Mozambique and Indonesia. They can be eaten fresh in salads, pressed to make juices, cooked in syrup or made into jams to preserve them. Cashew pulp is the residue of the separation of the nut from the pseudofruit, and cashew bagasse (cashew pomace, cashew apple waste) is the residue of the juice extraction from the pseudofruit. Both products are suitable for livestock feeding. It should be noted that the term "cashew pulp" is ambiguous and sometimes used for the bagasse (Geron et al., 2013). Cashew nut oil meal, or cashew nut oil cake, is the residue of the oil extraction from kernels. It is suitable for livestock feeding. Cashew nut testa are the red skins that are manually or mechanically removed in the final step of preparing cashew nuts for confectionery. These skins may contain pieces of broken kernels and can be used as feed (Donkoh et al., 2012). Cashew tree leaves can be cut and eaten fresh or cooked. 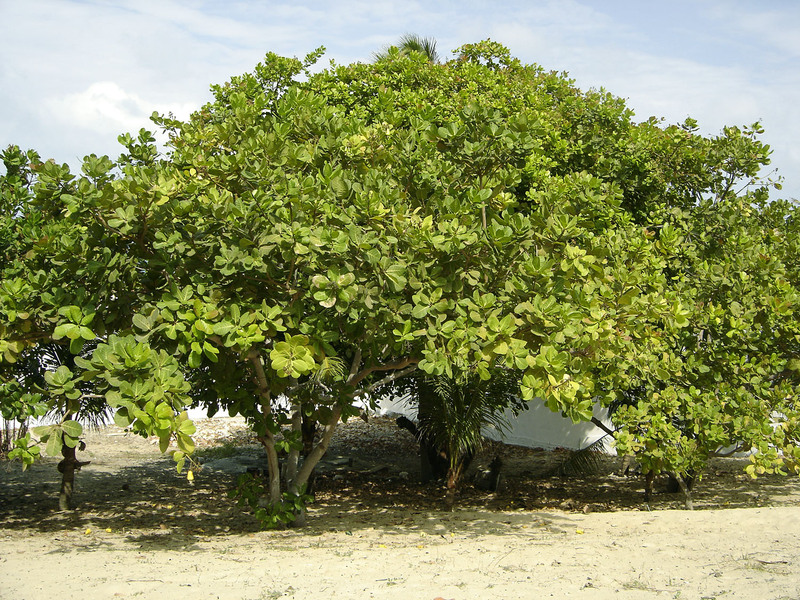 Cashew tree timber provides good firewood and can make valuable charcoal. The nut shells can be burnt to produce heat to be used in the processing of Cashew Nut Shell Liquid. Cashew Nut Shell Liquid (CNSL), also known as cashew shell oil, is contained in the fruit mesocarp. It is a mixture of 70% anacardic acid (a salicylic acid analog, and a strong skin irritant) with 18% cardol, and 5% cardanol. The two latter components are caustic phenolic substances that readily polymerize and are used for epoxy resins, varnishes, and many high-tech materials that can withstand high temperatures, such as brake linings (Orwa et al., 2009; Duke, 1983). CNSL is also used as a pesticide against termites in timber, and the bark gum is repellent to insects (Duke, 1983). The cashew tree is native to tropical America, from Mexico and the West Indies to Brazil and Peru. It was brought to Mozambique by the Portuguese in the 16th century. It is now widely naturalized in the tropics, particularly in coastal areas (Orwa et al., 2009; Duke, 1983; FAO, 1982). The cashew tree grows wild in many places and is found from sea level up to an altitude of 1000 m (FAO, 1982). It can grow in places where annual rainfall ranges from 700 mm to 4200 mm, but does better between 700 and 2000 mm, with an annual temperature between 21°C and 28°C (Orwa et al., 2009; Duke, 1983; FAO, 1982). The tree is very tolerant of drought and can survive a 2-5 month dry season (Duke, 1983). Cashew nut production and quality are better if the period during flowering and fruit maturation is dry (Orwa et al., 2009). 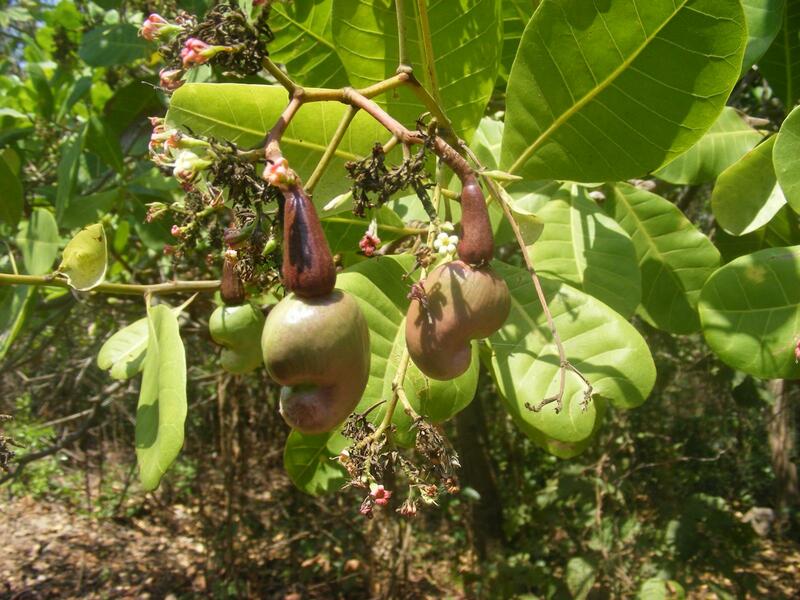 The cashew tree can grow in a wide range of soils including infertile and very shallow savanna soils. In very dry areas, it needs well-drained and deep soils to survive (Orwa et al., 2009; Duke, 1983). The tree is not as salt tolerant as other coastal tree species and it cannot survive frost (Orwa et al., 2009; Duke, 1983). In 2013, the world production of cashew nuts was 4.39 million t. The 5 most important producers were Vietnam (1.1 million t), Nigeria (0.97 million t), India (0.75 million t), Côte d'Ivoire (0.45 million t) and Benin (0.18 million t). The 5 most important producers of cashew apples were Brazil, Mali, Madagascar and Guyana (FAO, 2015). Cashew nuts are harvested when mature, and fruit and pseudofruit are separated. In Asia, the nut is the most valuable product and is separated from the apple which remains on the ground or goes to waste. The nut is then sun-dried before kernel extraction (Mohod et al., 2011). On the contrary, in South America and the West indies, the cashew apple is the most important product and is processed into juice, jams and beverages (ITDG, 2002; Morton, 1987). The cashew shell, when broken to extract the kernel, releases a caustic liquid (CNSL) that is a strong skin irritant. Processing requires gloves, or the nuts must be tumbled in sawdust or ashes to absorb the liquid (ITDG, 2002). Manual kernel extraction as practiced in some countries can cause serious burns on the hands of the workers. Several processes have been developed to reduce this hazard, such as pan- or drum-roasting, steaming prior to shelling and soaking in hot oil. In the roasting process, the exudate catches fire and produces a thick black and irritating smoke that causes air pollution (Sengupta, 2007). After roasting, the nuts are quenched with water to prevent further burning. The waste water also has some contaminant effect and must be treated (Mohod et al., 2011; Sengupta, 2007). The roasted shells become brittle and can be easily opened (Mohod et al., 2011). In the steaming process, the nuts are placed in a boiler and steam-cooked, which makes shelling easier and produces a higher percentage of whole kernels due to the increased elasticity of both the nuts and kernels (Mohod et al., 2011). In the oil soaking process, the nuts are put in a bath of hot oil (around 190°C) for a couple of minutes. The heat eases the CNSL release and nut shelling. Once the kernels are extracted, the thin testa surrounding them is removed by drying (ITDG, 2002). 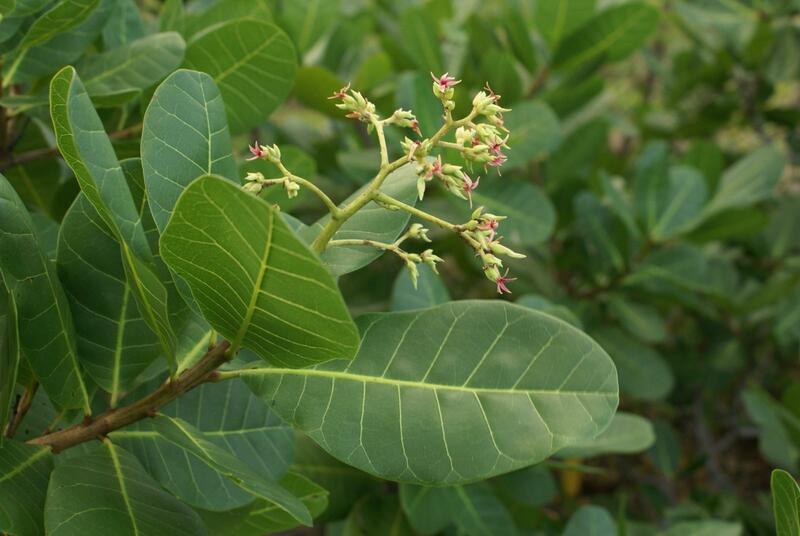 The cashew tree is a long-lived perennial, easy to grow, that can survive for 50 to 60 years (Azam-Ali et al., 2001). It can be propagated by seed or vegetatively. The seeds should be sown at a depth of 5-8 cm, and at spacings of 10 m x 10 m (Orwa et al., 2009). Vegetative propagation is achieved by layering, budding or grafting. Once established, the trees can be thinned to spacings of 20 m x 20 m, with a maximum population of no more than 250 trees/ha (Orwa et al., 2009; Duke, 1983). In the earlier stages of growth, the tree should be weeded to conserve soil moisture. Trees start bearing fruits after 3 years and reach full production between 10 and 30 years (Orwa et al., 2009). Fruiting mainly occurs in the dry season but is possible year-round (Duke, 1983). Fruit maturity is obtained in 3 months after flowering. Once mature, fruits are dropped off. Cashew nut production ranges from 10 to 48 kg/tree/year. The shelling of cashew nuts has deleterious effects on worker health and the environment as seen above in Processes. CNSL is harmful to the skin, the smoke pollutes the atmosphere and the wastewater contaminates soil and water. In India, the installation of cashew nut extraction plants is regulated: it is forbidden to build a cashew factory in the vicinity of hospitals, schools, airports and public buildings, and extraction plants must be at a distance of at least 500 m from each other (Sengupta, 2007). Discarded cashew nuts unfit for human consumption have a protein content in the range of 18-27% of DM, and an oil content of 36-51% of DM. Note that the scientific literature often uses the term "cashew nut meal" for discarded cashew nuts. The fibre content is generally low (crude fibre less than 8% of DM), but can be much higher (up to 16%) when the product contains a large proportion of shells (Lebas et al., 2012). Cashew nut oil consists largely in unsaturated fatty acids (60% oleic acid, 22% linoleic acid) (Lima et al., 2004). Cashew nut oil meal DM contains about 32-42% crude protein and very variable amounts of oil, depending on the extraction process. The fibre content is extremely low (crude fibre less than 2% of DM). Cashew pulp and cashew bagasse have a variable amount of protein (8-15% of DM) and are rich in fibre. 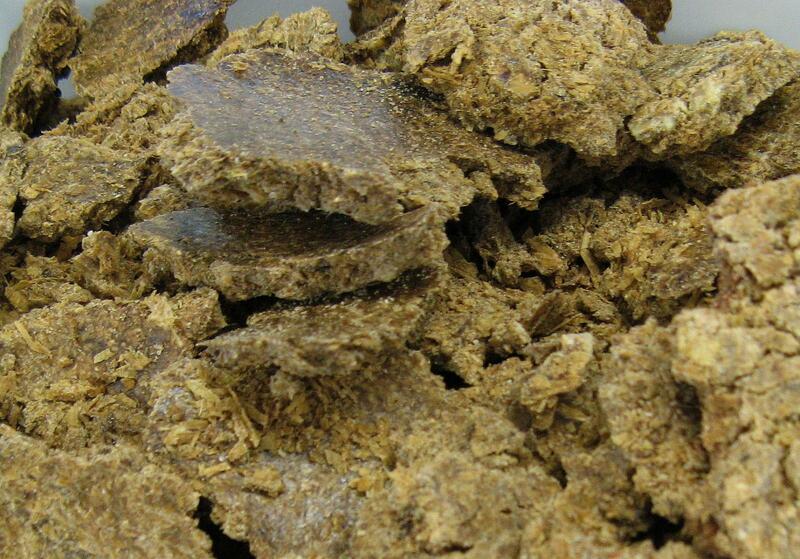 Lignin content is high (10-18% of DM). Cashew leaf DM contains 9-15% crude protein, with a high lignin content (15% of DM) and a high content of condensed tannins (16% of DM) (Mecha et al., 1980; Keir et al., 1997; Reddy et al., 2008). CNSL is a resinous phenolic substance that is highly corrosive and produces blisters, particularly on the fingers of workers who shell the nuts manually. Fresh cashew nuts should never be eaten raw, neither should they be broken before being processed (Small, 2011). It is necessary to wear gloves or use mechanical/chemical processes during kernel extraction (ITDG, 2002). Ground cashew nuts have been reported to cause diarrhoea if fed in large amounts to calves and dairy cows (Göhl, 1982). Cattle consuming fallen cashew apples at the time of harvest were reported to have difficulties in rumination and dizziness, due to possible ethanol intoxication (Assis et al., 2009). In Brazil, several cases of cattle poisoning due to cashew apples have been reported (Ribeiro Filho et al., 2012). Most of the outbreaks occurred after animals were allowed to eat fresh cashew apples ad libitum. It was suggested that cashew apple poisoning could be due to ethanol production in the rumen by fermentation (Ribeiro Filho et al., 2012). However, the poisoning lasts only a few hours, is reversible without treatment and seems to be non-lethal (Ribeiro Filho et al., 2012). Discarded cashew nuts, usually called cashew nut meal, is an energy and nutrient rich product that can be used at relatively high levels in ruminant diets, though one should pay attention to its high oil content. Most trials have taken place in Brazil. Up to 24% cashew nut meal (i.e. 7 kg/day) was included in a concentrate to supplement a sugarcane-based diet (Pimentel et al., 2007). Cashew nut meal was included at 50% of the dietary DM in a total mixed ration based on maize silage (Pimentel et al., 2012a). In both experiments, including CNM did not change milk yield compared to the control diet (Pimentel et al., 2012a; Pimentel et al., 2007). CNM inclusion (24%) in a sugarcane-based diet decreased milk fat content from 36.8 g/kg to 26.6 g/kg. In a maize silage-based diet, CNM had no effect on DM intake (21.3 kg/day) (Pimentel et al., 2012a). However, its inclusion at 24% of a sugarcane-based diet significantly reduced the DMI of the sugarcane from 7.7 to 7.05 kg DM/day, and overall diet DMI from 14 to 13.22 kg DM/day (Pimentel et al., 2007). The form in which cashew is offered (separately or mixed into the diet) may explain those contradictory results. The inclusion of cashew nuts in the ration did not affect rumen fermentation parameters (Pimentel et al., 2012b). In the semi-arid conditions of North-East Brazil, CNM included at 20% in dairy cow diets decreased the interval between post-partum and first ovulation (Brasil, 2003). Cashew nut meal can be safely introduced into sheep diets provided that the dietary lipid content is kept below 6-7%, as higher values will decrease fibre digestibility, DMI and forage digestibility (Silva et al., 2013). CNM was included at 13-18% of DM in a concentrate fed (1.2% BW) to supplement hay in breeding rams. It had no negative effect on sperm quality (Medeiros, 2005; Oliveira et al., 2014). CNM included at 12 or 24% of the DM into a concentrate fed to adult ewes as a supplement to hay had variable effects, depending on the inclusion rate. At the lower level, no deleterious effect was observed. At 24% inclusion, CNM increased the number of degenerated oocytes and lowered the proportion of viable oocytes. It was thus recommended to limit its inclusion in ewes (Fernandes et al., 2014). Most trials with cashew bagasse have taken place in Brazil, usually with sheep. It is not always clear whether the product tested is the bagasse (by-product of the juice extraction) or only the non-extracted pulp. Cashew bagasse has a low in vitro DM digestibility (46%), probably due to its high fibre and lignin content (Pereira et al., 2008). Ensiling up to 36% cashew bagasse with elephant grass improved the nutritive value of the silage compared to elephant grass alone, and provided better conservation (Ferreira et al., 2004). Treating cashew bagasse with urea improved its nutritive value (Dantas Filho, 2010). Including 19% dried cashew bagasse in diets containing elephant grass, sorghum and soybean meal for growing sheep resulted in the best fermentation parameters (Rogerio et al., 2009). 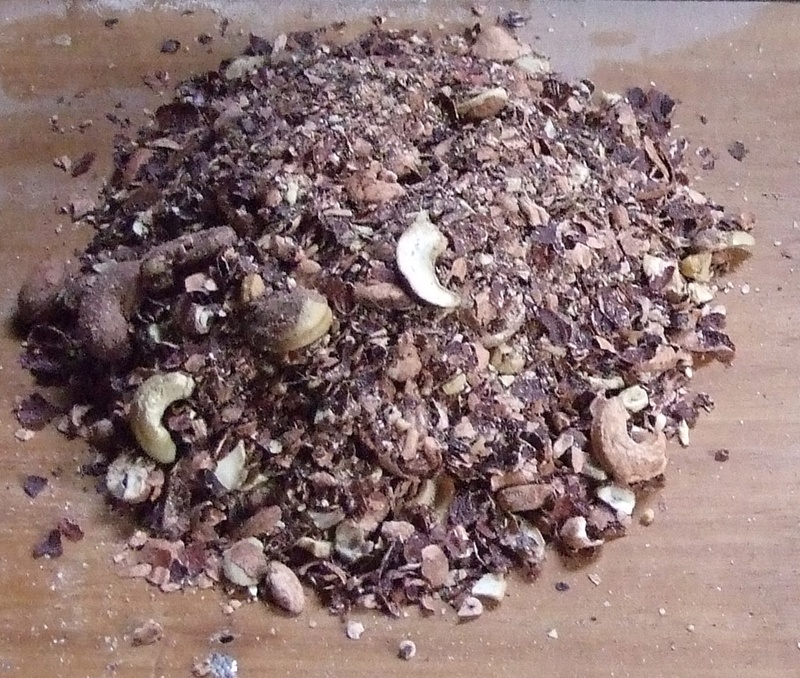 In Brazil, a mixture of equal proportions of dried cashew pulp and leucaena leaf meal was found to be suitable for growing sheep (Leite et al., 2005). Fed alone, fresh or dried cashew bagasse as forage had no effect on animal performance or age of puberty (Rodrigues et al., 2010). Dried cashew bagasse ensiled with elephant grass improved silage DM intake and growth of young sheep (Ferreira et al., 2004). Dried cashew bagasse replaced 50% of tropical forage in the diet of gestating and lactating ewes or of young growing male lambs without negative effects on the reproductive performance of ewes or on the age of puberty of lambs (Rodrigues et al., 2010; Rodrigues et al., 2011). Used as forage for fattening lambs, dried cashew bagasse improved feed conversion ratio and resulted in better carcass characteristics (Silva et al., 2011). In India, sun-dried cashew bagasse partly replaced (50%) groundnut meal in a concentrate offered to Gir dairy cows, to supplement a forage-based diet, without modifying milk yield (Sundaram, 1986). In Nigeria, cashew nut shells included at up to 20% of diet to West African dwarf goats fed an elephant grass-based diet resulted in lower feed intake, digestibility, daily weight gain, and degraded feed conversion ratio. However, they had no impact on blood parameters, even at 30% of the diet, and could reduce feed costs (Ocheja et al., 2014; Okolo et al., 2012). It has been suggested that CNSL may reduce methane emissions from ruminants (Kobayashi, 2012). An in vitro experiment showed that CNSL could favourably alter rumen microbes and inhibit methane production. In dairy cows, CNSL increased the production of propionate both in vitro and in vivo when fed at 4 g/100 kg BW, but not at lower levels (Coutinho et al., 2014). Cashew tree leaves are not a good supplement. They have a high concentration of tannins and lignin, which explained the low values observed for DM intake and DM digestibility in goats (Reddy et al., 2008). In India, cashew tree leaves offered as a supplement (300 g/d) to male goats fed ad libitum with elephant grass (Pennisetum purpureum), failed to improve diet DM digestibility (Reddy et al., 2009). In Nigeria, cashew leaves fed alone to lambs did not meet their nutritional requirements and caused nitrogen losses (Anugwa et al., 1987). In Côte d'Ivoire, cashew nut meal was fed at up to 6% of the diet to post-weaning pigs (6 to 12 week-old) without deleterious effect on growth performance. In growing pigs (12 to 24 week-old), including more than 5% CNM in the diet resulted in lower feed intake, lower daily gain and lower final live weight though it had no deleterious effect on health parameters. It was suggested that CNM could partly replace maize in the ration (Yao et al., 2013). An experiment in Nigeria concluded that CNM could be included in the diets of weaner pigs to replace soybean meal at up to 10% of the DM with little or no deleterious effect on rate of gain (Fanimo et al., 2004). It was reported that a much higher inclusion rate of CNM (30%) had no deleterious effect on animal performance, and reduced feed costs (Oddoye et al., 2011). In fattening pigs, diets containing CNM produced better results than those supplemented with groundnut meal (Fetuga et al., 1974). In Nigeria, growing pigs were fed cashew nut oil meal (expeller extracted) at up to 28% of the diet for eight weeks. Feed intake, true digestibility of N and N retention were all improved compared to those of pigs receiving groundnut meal in the diet (Fetuga et al., 1974). In the Philippines, fattening pigs were fed 20% fresh cashew apples or 20% sun-dried cashew apples as supplements to a mixed ration consisting of rice bran, maize meal and fish meal. Animal performance was not significantly different from those obtained with the control diet, and feed costs were significantly reduced (Acero et al., 2013). In Brazil, dried cashew bagasse was fed to growing pigs at up to 20% of the diet. Compared to soybean meal or sorghum, the protein digestibility (12%) and energy digestibility (23%) of the dried cashew bagasse were low, giving a low metabolizable energy (1051 kcal/kg), thus reducing the metabolizable energy of the diet (3225 kcal/kg vs. 4125 kcal/kg) (Farias et al., 2008). In rats used as a model for pig feeding, cashew nut testa was fed at up to 15% of the diet. However, increasing the cashew nut testa in the diet resulted in decreased feed intake, decreased water intake, lower live-weight gain and lower efficiency of feed utilisation. It was suggested that the optimal level of inclusion was around 5% (Donkoh et al., 2012). In Nigeria, cashew nut testa (used as a protein source and substitute for groundnut meal) together with dusa (a by-product of alcohol production from sorghum), each included at 25% of the diet for growing pigs (19 kg LW), were shown to have no deleterious effect on animal performance (Adesehinwa et al., 2004). In Brazil, however, the inclusion of cashew nut testa in rations for finishing pig resulted in a degraded feed conversion ratio, reduced carcass yield, bacon thickness and fat:meat ratio. It increased feed costs and was consequently not recommended (Pinheiro et al., 2000). Cashew nut meal can be included in broiler diets. Several experiments suggested that up to 20% CNM can be included in the diet without consequences on broiler performance (Oluwasola, 2006; Freitas et al., 2006; Sogunle et al., 2009). In some cases, growth performance and feed efficiency were improved by CNM, probably due to a higher energy value than anticipated in the feed formulation (Sogunle et al., 2009; Freitas et al., 2006). Feed intake was not negatively affected, and sometimes increased (Ojewola et al., 2004). Performance was slightly affected at the highest inclusion levels (30%) (Sogunle et al., 2009). Enzyme addition had no effect on CNM utilization (Fuentes et al., 2001). Internal fat deposition can be increased with high CNM diets, probably because of its high fat and energy content (Freitas et al., 2006; Oluwasola, 2006). There was no negative effect on meat quality, although meat from broilers fed CNM diets had a higher fat content (Adeyeye et al., 2007). In turkey poults, CNM was tried with success at 8% inclusion in the diet (Ogungbenro et al., 2013). In layers, CNM tended to have a negative effect on egg production. Laying performance decreased and feed efficiency was lowered with increasing CNM levels. Laying rate was 3% lower when only 5% CNM was added in the diet, and 14% lower when 25% CNM was used. Feed intake was stable (Cruz et al., 2015), or slightly lowered (Odunsi, 2002). In layers, the use of defatted cashew nuts improved results compared to full-fat CNM (Akande et al., 2015). In Cambodia, dried and ground cashew apples were included at up to 15% in the diet of growing ducks without adverse effects on weight gain (Meng Song et al., 2008). In broilers, the addition of 5% to 15% dehydrated cashew bagasse in the diet did not significantly affect growth performance, but feed intake was increased and feed efficiency was reduced (Ramos et al., 2006). In Nigeria, several studies have shown that cashew nut meal can replace 75% of full-fat soybeans in the diet of growing rabbits without alteration of growth rate or nutrients digestibility (Akindiji Akindele, 2002; Ademilua, 2003). At 100% replacement, the growth rate and feed efficiency were slightly altered, but this lower performance may be more because of the low lysine content of cashew nut proteins (4% of protein, below requirements) compared to that of soybeans (6%, above requirements), than of the presence of noxious contents in the cashew nuts. Growth of rabbits was identical or close to that of those fed the control diet when they were fed up to 20% cashew nut meal in balanced diets, independently of the fibre content. Even at such inclusion rate there was no significant adverse effects on carcass characteristics and sensory attributes (Akinnusi et al., 2007). In Nigeria, including sun-dried cashew pulp (Aribido et al., 2010) or cashew bagasse (Fanimo et al., 2003) in rabbit diets gave the best average daily gain, feed conversion ratio and protein efficiency ratio when the cashew waste was between 30-35% of the diet. However, a significant reduction in protein digestibility was observed (Fanimo et al., 2003). Dried cashew pulp and cashew bagasse may thus be considered as suitable sources of protein and energy for rabbit feeding. No information was found about the use of cashew nut products in fish nutrition (2015). In Nigeria, cashew bark extracts have been used as piscicides and as a stupefier in order to assist with fish cropping (Ekpendu et al., 2014; Fafioye, 2005).